Gravity assisted drainage positions (also known as GAD or postural drainage) can be used to assist the clearance of excess bronchial secretions from the lungs (Eaton et al 2007). The technique involves placing the patient in a position which allows gravity to assist in draining mucus from the periphery of the lungs to the central upper airway as shown in Fig 1&2 and Table 1. 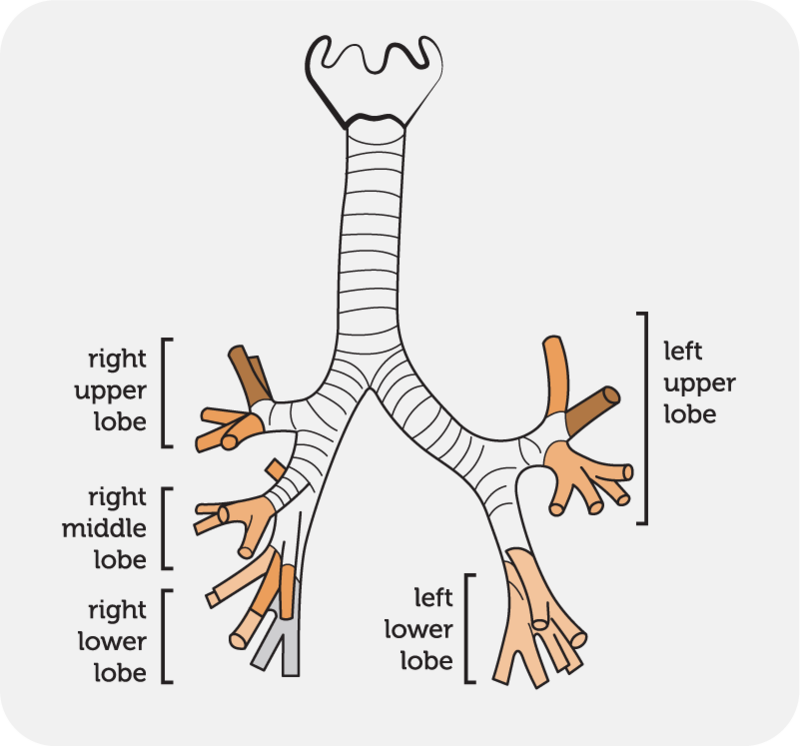 Depending on the anatomical angle of the lobes or segments of the lungs to be drained (Fig. 1), the patient may be placed in sitting, prone, supine, side lying or in a head down tilt of between 15 and 30 degrees. The resulting positive effect on airway clearance and secretion expectoration is due to both gravity assisting drainage and improved ventilation (Lannefors & Wollmer 1992, Zack et al 1974). Lying on the left side horizontally turned 45 degrees on to the face, resting against a pillow with another supporting the head. Lying on the right side turned 45 degrees on to the face, with 3 pillows arranged to lift the shoulders 30 cm from the horizontal. Lying supine with the knees flexed. Lying supine with the body a quarter turned to the right maintained by a pillow under the left side from shoulder to hip. The chest is tilted downwards to an angle of 15 degrees. 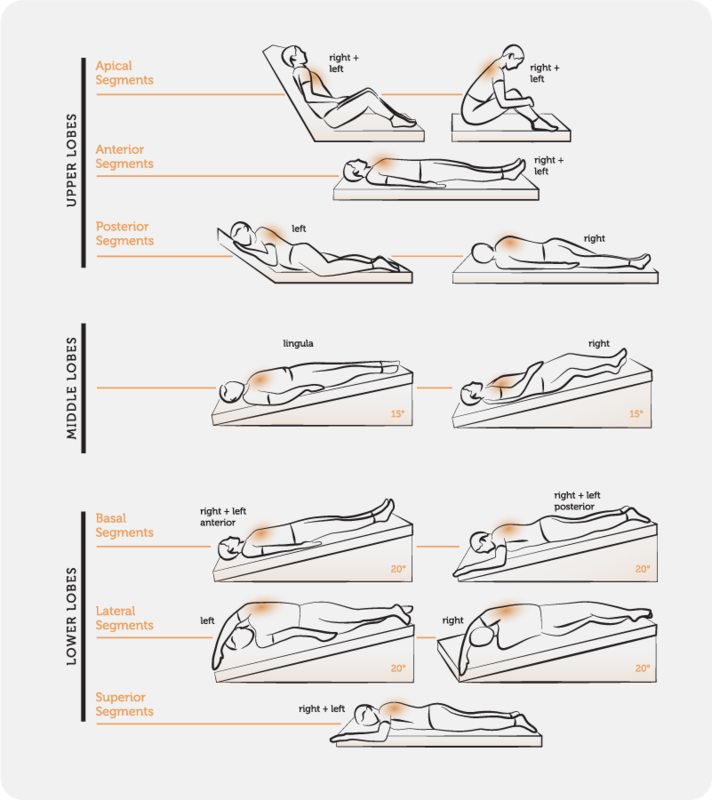 4&5	Lying supine with the body a quarter turned to the left maintained by a pillow under the right side from shoulder to hip. Lying prone with a pillow under the abdomen. Lying on the right side with the chest tilted downwards to an angle of 20 degrees. Lying supine with the knees flexed and the chest tilted downwards to an angle of 20 degrees. Lying on the opposite side with the chest tilted downwards to an angle of 20 degrees. Lying prone with a pillow under the hips and the chest tilted downwards to an angle of 20 degrees. Until the 1990’s, excess lung secretions were generally managed with GAD and Manual Techniques (see manual techniques video). More recently, alternative techniques have been researched and evidence has found that GAD can cause gastro-oesophageal reflux (GOR) in cystic fibrosis (Button et al 1997). Modified GAD positions, such as side lying (without a head down tilt), have been found to be as effective in clearing excess secretions when compared to head down positions (Cecins et al 1999). To-day, in many countries, modified postural drainage positions, with the elimination of a head down tilt, are the accepted method of treatment. GAD and manual techniques can be time consuming, often require the assistance of a second person and can be uncomfortable for the patient. As a result adherence with this treatment regimen is very low (Passero et al 1981). The combination of GAD and manual techniques may be beneficial in large sputum producing patients. Consequently, for patients with chronic lung disease, such as non-cystic fibrosis bronchiectasis (where the middle and lower lobes are generally the most affected and anatomically require a head down tilt for GAD), alternative methods of airways clearance may be more appropriate. A head down tilt should be avoided for patients with confirmed GOR or symptoms of reflux. It may be considered for patients with no symptoms of reflux but careful monitoring of symptoms and lung function trends is desirable. During an acute exacerbation, where a patient may be too unwell to manage other more active treatments (such as PEP therapy), modified GAD may be an appropriate short term treatment option. Following a session of GAD secretions are cleared using expiratory manoeuvres such as the forced expiratory technique (FET) and coughing (see FET video ). While there is limited evidence of GAD in isolation in people with bronchiectasis, a single session of treatment resulted in greater sputum expectoration compared to no treatment (Sutton et al 1986). As it is most frequently combined with other techniques, the combination of GAD and manual techniques is safe, well tolerated and facilitates secretion removal (Mazzocco et al 1985).